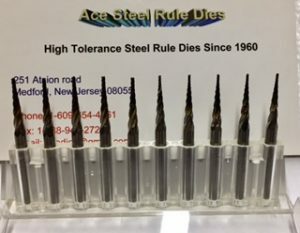 For the past 57 years Ace Steel Rule Dies LLC has been the industry’s pioneering Steel Rule Die Making company. We specialize in Gasket cutting steel rule dies and Medical Dies. Our state of the Art steel rule die making facility incorporates the latest automated technologies to create the highest quality steel rule dies. We understand the importance of our customers time, requirements and expectations of a quality steel rule die. Our legendary 5 MINUTE QUOTE policy is unmatched! These are used 2pt & 3pt kerf cutter router bits for making steel rule dies using a Gerber Profile Die Board router system or similar CNC Router. We replace our bits on a rigid schedule regardless of use. To date we have never broken a bit! Now we are offering these bits at a tremendous discount. The pack includes qty 5: 2pt kerf bits and qty 5: 3pt kerf bits. The bits come as a 10pc pack (5 of each size). $100 for 10 bits! Bits ship in a locking case which protects the bits from touching each other. Click Here to Purchase from our Steel Rule Die Supply Store.